For Sanford locals, it’s no surprise to find Fire Ant mounds in the yard. But, if you’re a newcomer this reddish invader can make your life miserable. Fire ants in established turfgrass are considered serious nuisance pests due to formed mounds interfering with ball play on golf courses, damaging equipment and are unsightly in home lawns. Additionally, when encountered by humans, pets, livestock and other animals, their stings can cause serious pain and injury. Fire ant colonies consist of three adult types: winged males, reproductive (females) and worker ants. Winged males and reproductive start to fly when temperatures are between 70-95°F (spring and fall) and mate in flight. 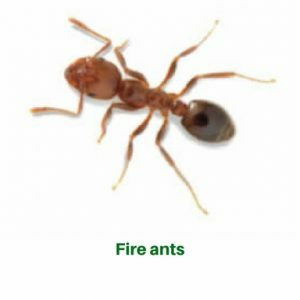 The goal of Sanford, NC Green Garden Landscaping management program is to preventively suppress fire ants as much as possible., that is why we use the best product in the market. We use a product that is formulated with a superior carrier which will give longer residual than other granules. This superior residual results in longer ant control and fewer re-treatments over a one year period. Our product will hold up longer to conditions such as rain and regularly scheduled irrigation programs. Green Garden Landscaping in Sanford, NC professionals are trained to identify these pests and prescribe a proper course of action. Consult Green Garden Landscaping Sanford, NC today to schedule your treatment program. Contact us today for your free Fire ants control estimate.